Having mastered our vegetable cutting skills and had some dessert, let’s move onto some delicious creamy hummus. There are so many pages, both virtual and paper, dedicated to hummus I cannot possibly compete, indeed that is not my goal. What I hope to encourage you to do is to make your own. 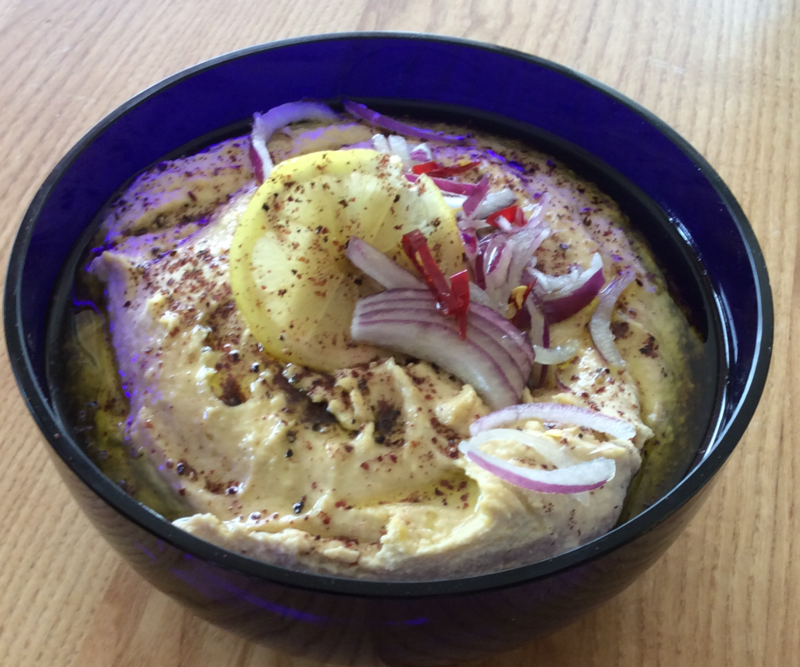 Yes, yes, I know you can buy it everywhere, but you can’t top hummus you have made yourself. Those who make their own anyway can go back to their Sunday brunch now. 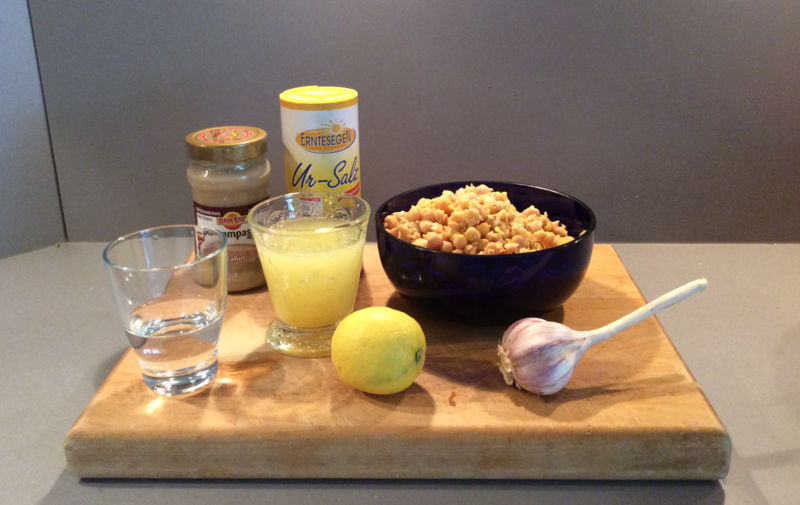 If making hummus spontaneously, use the canned chickpeas that I know you have in your cupboard. Whether cooked, or canned, peel them. Don’t laugh. It makes a huge difference. I swirl them around in the water, running and rubbing them through my fingers. Keep pouring the skins and water away, until you’ve got nearly all the skins off. I took photos. Salt – and lots of it- it needs it. 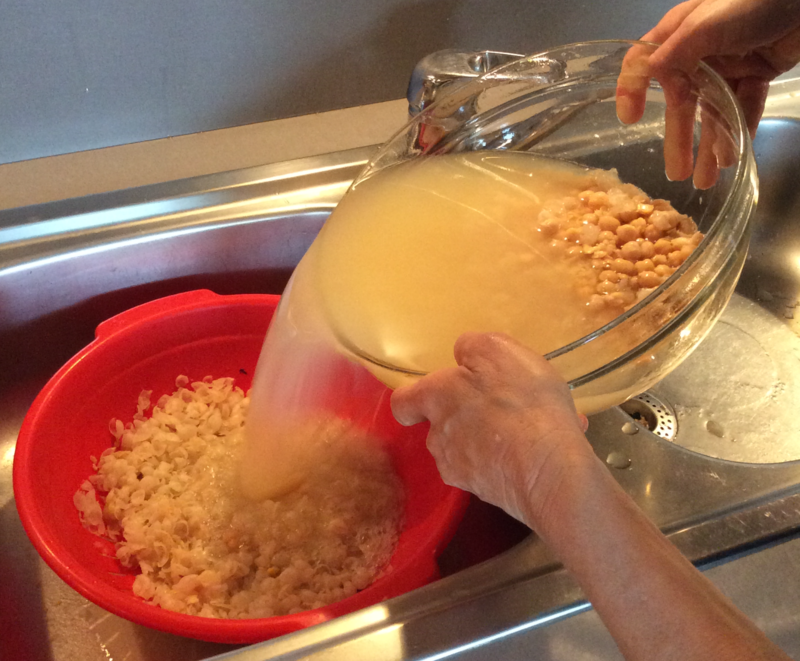 Put all of the chickpeas into a food processor. Process until they are mushed up. Add the tahini, lemon juice, garlic, and salt. Process some more. Then drizzle in the iced water and process for about 4 minutes. You can of course add little more if it is too thick, and taste it of course. More than once! Don’t worry if you don’t have a processor. Spend some time doing all of the above, but with a fork. It takes a while, but it is just as good. It will not be as smooth, that’s all. Put it into a serving bowl. Decorate it with whatever you have. Chilies, onions, lemon slices, parsley… Drizzle with olive oil. Adding oil to hummus is a western practice. DON’T DO IT. Serve your hummus with the vegetable platter you have been perfecting since last month, and some good bread. Or just eat it by the spoonful like my kids do. Yum. This entry was posted in Food and tagged cooking, Food, Hummus. Bookmark the permalink. Great pics Val! I was planning on making a batch of hummus today as well. Yummy! We eat it with raw veggies but sometimes also with chicken. Yum-Yum!! !Nothing beats homemade! !Love Hummus as a spread on fresh,warm homemade bread,and as a condiment with chicken breast.Your recipe sounds yummy! Thanks for the fab recipe, Val! Love hummus with strips of pitta bread. I love hummus but I’m too tired to make any right now.